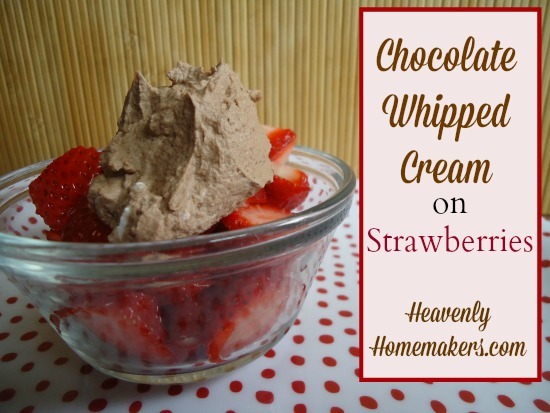 My life has not been the same since I discovered this Chocolate Whipped Cream. My men ban me from doing any work on Mother’s Day. They take over the kitchen, putting together all the meals in a way that is both hilarious and beautiful to me. Sometimes, I shout instructions from the living room. Other times I offer some quiet advice to help avoid culinary disaster. But they always do a nice job working together, and I’ve found it’s best if I simply walk away and let them do things their way. Therefore, I needed a Mother’s Day dessert that was easy to make. I needed a Mother’s Day dessert that could be made ahead of time. I needed a Mother’s Day dessert that was low in sugar. And I needed chocolate. Obviously. There’s nothing like inventing a recipe in my head, then writing it down and handing it to my boys to experiment with. Why give them a tried and true recipe when something else sounds better…inside my head. Right? Bless my boys. They are so used to how I roll in the kitchen, they didn’t even blink when I said, “For dessert, we’re going to try something new.” I’m sure they expected nothing less. In a bowl, whip the cream until soft peaks form. Add cocoa and stevia, and whip again for a few seconds until ingredients are mixed well. Serve on top of sliced strawberries. Everyone loved this dessert! The boys especially loved that I said, “Have as much as you want.” When do I ever say that about dessert? Never. But with this, since it is sweetened with stevia, I felt no need to limit how much they ate. This will be a great breakfast, snack, or dessert that we’ll surely be making over and over. Now it’s your turn. 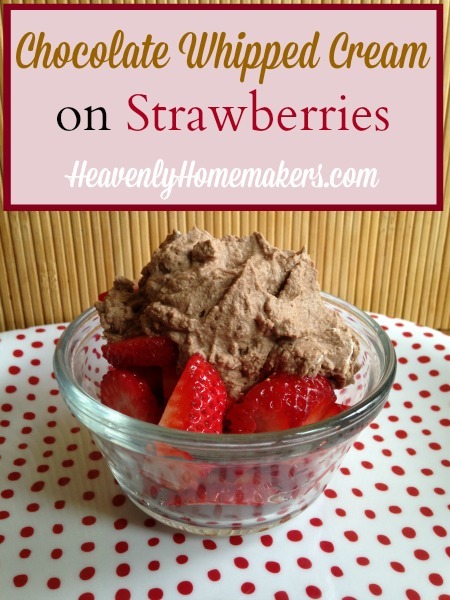 Make this Chocolate Whipped Cream and sit back and enjoy it guilt free. Oh sweet happiness in a bowl. What dessert did you request for Mother’s Day? We had cupcakes for our grandson’s 6th birthday. It was kind of an odd Mother’s Day/ little boy birthday day. What brand of liquid stevia do you recommend? I’ve been wantng to try it, but I’m afraid of choosing one with a bitter aftertaste like the powder I’ve tried. Is the liquid not that way? That dessert looks amazing! I like NuNaturals liquid. This also tastes bitter if too much is used, but it is definitely the best I’ve tried and doesn’t have an aftertaste at all if used correctly! Have you ever used stevia in baking? Does NuNaturals give you any equivalency amounts for sugar? Every kind of stevia I’ve tried tastes bitter to me even when I start with just a little & then keep adding to it. Oh yum! I am going to try this with fat free cream. I know that’s not good, and wouldn’t eat it usually, but, am on a diet and that’s what it calls for. Will be a different yummy treat for me! Could some other form of sweetener be used? We don’t use stevia. But, I font know what a good “real” sugar replacement would be? Thanks! I made brownies (from scratch) and bought some vanilla bean ice cream. We took dessert to my parent’s house. :) I should’ve made more brownies…there were none left. Can you use agave? or sugar in the raw? Yes, I think either of those would work fine! You rock, Laura! This was awesome. We will be going on our 3rd batch soon. Sooooo good!!! Just made this… we sliced up a banana, put it in freezer for a bit, and served it on top of that! Needed some homemade peanut butter in my bowl though… I love banana, chocolate, peanut butter combo! I added a splash of vanilla to mine…I have a half gallon of homemade extract still so might as well. :) It was amazing! I am regretting not getting raw cream from our food co-op now! Shucks!!!! I may just have to get some from the store to make this!!! WOW sounds so good!! But with chocolate is that so surprising lol! :-D You are always coming up with great new and simply whole food recipes Laura!! Thank you for sharing your gift with us!!! My family has been so blessed by your food ministry!! I would make it with coconut cream for a dairy free alternative and either stevia, maple syrup or coconut sugar or syrup. Agave is not healthy and xylitol is made from corn so I can’t have that. Made this tonight and it was quick and delicious! Ate it with apples and strawberries. YUM! A few nights ago we made the Easy Cream Cheese Fruit Dip and it too was delicious and quick! Also ate it with apples and strawberries…but my favorite was with kiwi. :) Thanks Laura for all your delicious recipes! So I made this tonight. One small change I made a syrup with xylitol and used that as the sweetener. I didn’t have stevia. It was amazing, but the kids didn’t like it. Super bonus for me.